The Wall Street journal posted a review of Grand Theft Auto IV today written by Junot Diaz, the Pulitzer-Prize winning author of The Brief Wondrous Life of Oscar Wao and Drown. It's a good review, and clearly written by someone who has both a good sense of the virtues of the series' innovative gameplay (what he aptly terms the “grammar” of the series, its mix of driving and third-person adventure in a sandbox environment), and a familiarity with the narrative texture of the previous installments of the series. Diaz is clearly a fan of the games, and for that reason his argument that the favorable comparisons to The Godfather bestowed upon the game by several members of the enthusiast press betray a serious lack of critical perspective is persuasive and well-taken. GTAIV is a great game, but The Godfather it ain't. As someone who has hopes for games as art I don't think there's any shame in acknowledging that the young medium has yet to produce anything whose cultural value is comparable to the great works of cinema. Diaz faults the game's plot on the grounds that it fails as a depiction of the immigrant experience. I think his reasons for this claim are contestable, but I want to quote another point Diaz makes: “For me, GTA IV is more an example of our evasions as a culture, more of a fairy tale, more of a story of consolation than a shattering cultural critique or even, dare I say it, great art. GTA IV is a game that allows you to forget how screwed-up and complicated things are in the real world; it could have done more, it could have put that screwed-up complicated world front and center.” I think the charge that the game is uncomplicated in its depiction of the world and the immigrant experience in particular is quite right; the game isn't centered around the challenges that face most immigrants to the United States: earning a living in a context where the conditions of employment are likely to be exploitative, avoiding Immigration authorities, and so on. But I think that this charge misses the point that GTAIV's most successful mode of critique is not gritty realism but broad satire. The creative team at Rockstar games, the series' developer, has exactly one satirical tool, and it consists of taking the various elements of American culture-- its television, its movies, its advertising, its products, its various ethnic and professional stereotypes-- and ratcheting up their vulgarity to maximum. Rockstar's team has a definite flair for the grotesque, and when this technique works it succeeds in exposing the essential vulgarity and cheapness of the recognizable real-world counterparts of the game's virtual products. In this sense the real object of critique in the GTA series is not the depredations visited on immigrants in the Bush era but American consumer culture of the last four decades. In GTA's New York, the Statue of Liberty is replaced by the Statue of Happiness, and she holds a coffee cup aloft in lieu of a torch. Now, this isn't Gulliver's Travels, to be sure. But it's not a consoling picture of our culture, either. There's something to be said for using a video game to hold a funhouse mirror in front of American life. This effort doesn't go off without a hitch, certainly (The game becomes very unfunny when it devotes its general mean-spiritedness to caricaturing those marginalized in American culture-- homosexuals, women, and minorities. Mitch Krpata noted his queasiness on this score in a blog post. ), but the satirical take on American culture the game presents offers something beyond mere escapism. "It's as if the Superman ride at Great America stopped every 40 seconds for a sentimental speech about Superman's complicated relationship with his adopted planet, and his angst at being the only surviving member of his alien race." I think that like many of my friends, I have gone through this experience in my late '20s where music has come to play a smaller part of my life. Since college, I don't keep up on the new releases, I don't get to too many shows, etc. I catch as catch can and poach new music off the year-end best-of lists on Pitchfork. I don't always take my iPod with me, the way that I kept my minidisc player on my person nearly every time I left the house at Brown. You feel a sense of guilt about this, a sense that you are impoverishing yourself allowing an important part of your life-- the love of music-- slip away as you get older and lazier. I heard a story on NPR recently about the demise of creativity and imagination in American culture. The piece was annoying in its yearning after the good ol' days, seemingly blind to the fact that new forms of media inspire children in much the same way old ones did. (When I was a kid, I had a sketchbook full of designs for a video game I had made up-- little drawings of ships and cars whose offensive and defense capabilities were fleshed out in minute detail. I'm pretty sure it was meant to be a more complicated version of Defender.) Anyways, one caller talked about how his family used to gather around a player piano with neighbors and sing along to recent pop tunes for entertainment, and he despaired that this habit of social music-making has gone by the wayside. 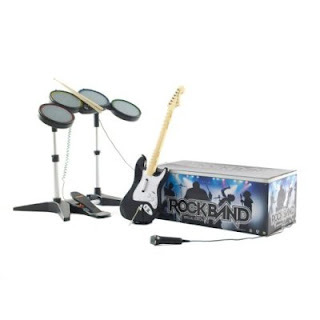 When I heard the caller reminisce about this experience it reminded me of Rock Band, which I have been playing obsessively with my roommates and friends nearly every day for months. While the game can't replace the experience of mastering real musical instruments, what it really does realize is the experience described by the caller-- the social experience of getting together with friends and participating in music that you could not, strictly speaking, create by your own means without a good deal more training. If you can put aside the absurdity/shame of having numerous prosthetic musical instruments in your living room (it helps to think of them as synthesizers), the game is straight out fantastic. (Our band, “Just the Tip” has t-shirts. I have yet to make a t-shirt for my solo project, “The Guermantes Way.”). I spend so much time crooning tracks from the game to myself at work these days (the game really unearths my heretofore undiscovered lust to croon) that my coworkers probably know the game's setlist by now. I think the success of Rock Band and Guitar Hero among casual gamers, and my many many friends who would otherwise avoid video games, shows that the player-piano spirit is alive and well. When I'm old I'll call into NPR , and I'll look back on Rock Band with a sentimental fondness that will annoy the youth. The opposition between the dictates of this business model and the dictates of individual creativity is clear. People who have romantic-era aspirations for the medium and unnegotiable creative visions find the games-making industry inhospitable. Because the production of large-scale games is largely the co-operative effort of large creative teams, games rarely present the creative viewpoint of any one individual even when they do manage to present a creative viewpoint at all. A comparison to the Harry Potter movies might help here: just as the central narrative given by the books provides a loose framework shaped by a changing cast of directors with different creative sensibilities, the basic play mechanics of a series (some particular variety of shooting, driving, whatever) provide a loose framework for a changing cast of game designers. A notable exception to this general trend is the Japanese game designer Hideo Kojima, the creator of the Metal Gear series-- Kojima's games bear the clear creative imprint of his unusual authorial sensibility in their visual style, storytelling, and humor. Michael Abbot recently compared him to the film director D.W. Griffith, and this comparison nails the fact that Kojima is a meticulous auteur with serious creative blind spots. Back in the late 1960s, the Yale literary critic Harold Bloom argued that the basic dynamic behind artistic creation is a psychological dynamic he called agon. New works of literature are a product of the artist's struggle to overcome the generic forms of his precursors, and the artist is always spurred by a distinctly Freudian anxiety about his relationship with his artistic forebears. While Bloom's theory was meant to describe interpersonal and intergenerational creative struggles, it works quite well as a description of a certain intrapersonal creative struggle as well. Kojima, who is in the business of producing sequels to a popular video game franchise, has found ways to express a fundamental anxiety about producing a series of games that rehearse a well-cemented set of forms and conventions: a main protagonist named Snake fights exactly four battles with grotesque, animal-inspired bosses each game, encounters cyborg ninjas, smokes cigarettes, etc. At the end of the second game in the series, the game's main villain explains that the whole game has been an elaborately calculated training mission meant to reproduce the events of the first game. (The tone of this revelation is quasi-hysterical: “Don't you see! It's just the same thing over again!”) The final installment of the series begins with a surreal filmed cooking show with containing some serious Freudian overtones: the actor cries “this is the last chapter of this snake's life!” and chops a coral snake in half with a cleaver. At other points in the game, the solider-protagonist laments that he has been trapped in a system where he has been fated to perform the same actions over and over again, and I believe this complaint is meant to work at multiple registers. Shawn Elliot proposes that certain scenes in the game are meant to the point up the obsolescence of the series' basic mechanics and environments. Kojima's work is brilliant when it manages to sound his main points of thematic emphasis-- control, governance, inheritance-- at various levels in this way, but this very dynamic is what really ruins the last game in the latter half. (Kojima cannot illustrate themes except by explicitly telling you what they are in the course of a cutscene) At points, it seems as if Kojima was pressured both to reproduce the basic four-act structure of the series and wrap up every detail of the series' absurdly complicated plot, and as a result the second portion game is given over to exposition. Kojima really is a creative genius of sorts, and the final installment shows some serious flashes of brilliance, but he still has yet overcome his anxious relationship to his own past works. In History and Class Consciousness, Georg Lukacs proposed that the central dynamic of capitalism is a phenomenon he called reification, or the transformation of people into things. For capitalism to take root and displace pre-capitalist modes of production, human labor had to be turned into a commodity whose price (wages) was regulated by the market. The result of this process is the transformation of human life into an instrument of the economic system; while economies were originally created to serve human interests, the logic of capitalism dictates that human beings be regarded as instruments for the realization of profit, the immanent end of the market. Lukacs thought that this reifying logic of capitalism came to permeate all aspects of human culture under capitalism, and that only Marxism could put human needs back at the center of economic organization. Arts and culture had a dual role on his vision: on one hand, the often mirrored the governing logic of the era; on the other, they served as places where the distorting effects of capitalist life were brought to the surface and interrogated. Metal Gear Solid 4, a new game by the Japanese game designer Hideo Kojima, is set in a future where war has displaced oil as the basic productive force in the world economy. The basic conceit is that private military corporations, or PMCs, have become largest segment of the international economy. In this imagined future various technological advancements have made it possible for these corporations to completely monitor and control the actions of their soldiers on the battlefield through computers and nanomachines. These wars pursued for economic gain have come to replace the “old” 20th century wars fought between sovereign nations for territory. Regardless of whether you think this is an immanently plausible scenario, I have to admit I found this a compelling line of argument for a video game to make. The series' protagonist, a prematurely aged soldier named Snake (don't ask), complains that all soldiers are fated to be instruments in the service of remote powers. The irony, of course, is that the protagonist of a video game really is just a locus for external control. A game character is a puppet manipulated by a third party, the player. In previous installments of this series Kojima exploited this irony to good thematic effect, and he does so here as well. (One boss is a puppeteer-- when she takes control of the player you can see a set of marionette lines stretch from his limbs up to the ceiling. I have heard that when the player makes a some horrific mistake controlling the character-- say, walking off a cliff by accident-- the strings are visible as you fall.) The gamer's control of the main character in a game is a ripe ground for exploration, and one of the lessons I took away from the earlier games in the series (notably Metal Gear Solid 2) is that games might, as a medium, be able to interrogate themes of control and agency in ways unavailable in other media. They can do this by exploiting the gamer's control over their avatar, playing on the identification that occurs between the player and the game's hero. Metal Gear Solid 4 fails to see this idea through; about halfway through it becomes weighed down by the need to resolve the series' byzantine plot through long expository cutscenes, and the game becomes freighted with so many points of thematic emphasis by the end that it fails to give a cohesive statement of any of them. While the presentation of the game as a whole and the cinemas in particular represents a high-water mark for the medium (one that is only comparable to GTAIV's gonzo similacrum of New York in its meticulous devotion to the small details that make for realism-- mice skittering in the corners of basements, visible breath in cold environments), it really exemplifies a disconnect between gameplay and storytelling that results from the series' overreliance on filmic techniques to convey narrative. And so the last half of the game is essentially a b-grade computer-animated spy melodrama about war, religion, information technology and the anxiety of influence. All this is done with level of narrative and visual sophistication miles above the average video game, but the medium has a long way to go.